A new 12,500-seater arena with 10,300sqm of conference facilities is to be built on Gateshead Quays. The £200m development will occupy a 10-acre site between Sage Gateshead and BALTIC Centre for Contemporary Art, relocating the existing Metro Radio Arena. Once finished, it will also boast a hotel, bars and restaurants, creating a new destination on the waterfront with easy access to the Quays, Gateshead Town Centre and the wider region. Gateshead Council is working with property developers Ask Real Estate, investment and development manager PATRIZIA UK, and venue management specialist SMG Europe on the development. The new facilities will be capable of holding major music and cultural events, as well as conferences and exhibitions, and is anticipated to attract an extra 296,000 visitors to the region with an estimated boost of over £29.5m annually to the regional economy in future years. Paul Szomoru, head of business tourism at NewcastleGateshead Convention Bureau said: "While we consistently ‘punch above our weight’ as a destination, what we have always needed to enable us to attract the biggest major international conventions is a large flat floor space capable of holding exhibitions and dinners for over 1,000 people, with suitable break out space for events of 1,000+ people. "We’ve always had the ambition and the strength of voice, and the announcement of plans to develop a dedicated conference and events space on Gateshead Quays will help us fulfill our ambitions to cement NewcastleGateshead’s place on the international map." Gateshead council leader, Martin Gannon added: "We’ve wanted to regenerate and revitalise this key site on Gateshead Quays for a long time and internationally recognisable facilities of this scale has always been our long term aspiration. "Not only will they bring new life to the area but they will bring new jobs and significantly boost the local and regional economy. An arena and conference and exhibition facility will also play an important role in complementing and strengthening demand for national and international conferences, exhibitions and events at Sage Gateshead and BALTIC, as well as acting as a catalyst for wider investment across Gateshead and further stimulating economic growth. "We’re now more confident than ever that we can finally push forward with our exciting plans for this £200 million development site. Working closely with our development partners, SMG Europe, local partners and the private sector, it really is time to give the North East another landmark destination and complete the picture of this truly unique, riverside site." SMG Europe operates the Metro Radio Arena. John Sharkey, executive vice president of SMG's European operations said: "We’ve for some time been looking at increasing our presence in the North East. 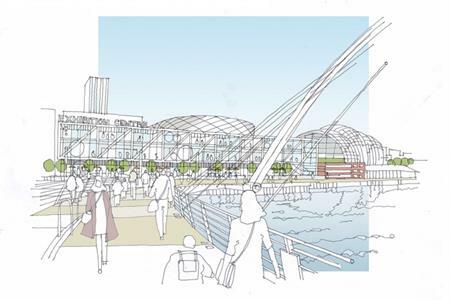 The Gateshead Quays development site is truly a unique location which will offer visitors a whole new experience. "Our new entertainment, conferencing and exhibition facilities, standing shoulder to shoulder with Sage Gateshead and BALTIC, will we firmly believe, further cement Gateshead Quays as a popular and stunning world class cultural destination, whilst bringing significant benefits for the whole region as well as Newcastle and Gateshead." The next steps for the development are for a detailed scheme design to be drawn up ahead of pre-planning and pre-construction phases.